This bill must be a joke. The retailers are offering a discount, the consumers are willing to buy, the quality may not be the best but the pennies are usually spent on Christmas presents. Political parties are quick to complain about the cost of Christmas, and are also quick to push up the costs with silly laws. Black Friday isn't about people buying more, it's about people buying the same but spending less. Black Friday is a mad rush to pick up bargains for the kids' Christmas presents. The government should not push up the cost of Christmas. Amazon started their deals last Sunday and they run up until tomorrow for Cyber Monday. ASDA were the same, Tesco did similar, John Lewis did too. The shops have the offers run for several days rendering this bill ineffective. The shops could also change the dates creating a Fantastic Friday every second Friday in December. The idea of banning something you do not like does not work. The author's reasoning is one of personal belief with no real argument for it. He does not like pointless American traditions being imported, apparently. I did not see bills wanting to outlaw Halloween, school proms, graduation caps and gowns, Christmas trees, Valentine's Day, praying, anthems before sporting events. There are plenty of traditions which are arguably as pointless with no cultural root as Black Friday is. The tradition claim is facade, the real reason is the author's hatred of consumerism. In this case I will unfortunately have to nay. There is no clear reason for the bill and this case it will make no sense to interfere in retail. The authors reasoning is one of personal belief with no real argument for it. He does not like pointless American traditions being imported, apparently. I did not see bills wanting to outlaw Halloween, school proms, graduation caps and gowns, Christmas trees, Valentine's Day, praying, anthems before sporting events. There are plenty of traditions which are arguably as pointless with no cultural root as Black Friday is. The tradition claim is facade, the real reason is the author's hatred of consumerism. I'd be more than happy to see those go. I can spot at least one which isn't American too. Oh no. Consumers will be able to buy things at a massive discount and we encourage spending and economic activity. The horror. This is just an extension of the "I don't like something so we should ban it" doctrine. 1: I don't think the government should get involved yet. 2: I don't think this is the right bill for the job. Quite right, the USA does not have a monopoly on pointless traditions. The traditions I listed, in the context of Britain, are all culturally baseless with no point to them. The purpose of the list was to highlight you writing a bill based around something you strongly dislike and not having an actual reason for it. As if you did, and your reasoning stood up, you would have included school proms and Halloween in the bill. Sorry my right wing friends, but as authoritarian as I am and because I like the sentiment... aye. Let's keep this in America. I agree with the idea but the bill in it's current form I don't like unfortunately. I suppose it has a point in the US where it's the day after Thanksgiving and marks the transition from that into Christmas, but until we start celebrating Thanksgiving here (which would be almost as hypocritical as celebrating Independence Day) then it's an unwelcome import. Will you be applying this to online shopping and digital goods (e.g. Apps, PDF printout of something etc.) as well? If so, how do you expect to police tens of thousands of websites, many of which are run by individuals who are just trying to make a little extra on the side in addition to working and could've used Black Friday to help boost sales a little. As others have said, I really don't believe your personal opinion of Black Friday is enough of a reason for banning something that is harmless and contributes to economic activity. I recognise two problems resulting from the Black Friday: a) cultural – it's a Yankee tradition; b) it exposes how nasty desperate people are and leads to a huge mess (Fig. 1). The latter can be extended to any similar events… I should say shopping sprees! Figure 1: Desperate people trying to blow money on items that are beyond their limits in order to get some self-respect… while paradoxically falling to the bitter bottom of self-esteem. As to a), I don't want American bull****, yet I'm not the one who is shaping our culture. If the majority wants to adopt some customs, they are free to. The lefty way to tackle this is of course prohibition and deception (the ideas from this thread like advertising only up to 30% discounts). My way: let it be. As to b), people do that madness because they're unhappy. They need money to gain self-respect in our terribly diseased culture of consumerism. No, lefties, the solution is not to make everyone equal – that is preposterous. It's to work on improving the economical policy to ensure a strong middle class that will in effect boost the whole system. Getting rid of the Black Friday merely removes the symptoms – it doesn't cure the disease and perhaps only damages the impoverished in the long term. Actually I disagree with you on one big point, while I have no problem With shops offering a sale, the two big problems are security of people concerned (people reported injured due to fights) and your point about consumerism. I believe that black Friday actually results in people over spending as they are pressured into buying something they don't need purely because it's on sale. Thus, I disagree with Black Friday. And yes, as I said earlier, it could be easily avoided by extending it to cyber Monday, thus the bill might not tackle it well. Firstly I don't see any good reasonings to stop Black Friday, other than people being idiots, large sales is good for everyone. We go get things cheap, shops get loads of people buying their products because they seem cheap. Also, if we are going to create this why are we being prejudiced against one specific day of the year, either make this rule true for all days of the year, or don't do it at all. Yes, they won't be able to deliver goods contravening this law to the UK. There's no reason why companies can't run the offers over a longer period. It's ridiculous that people suggest that offer for a week < no offer < offer for the day. If that is the case, then it's 100% a Nay. I would have sympathised more if the reasoning was to do with the cost of police being called on rare occasions to some supermarkets. Instead, this is just an anti-consumer, anti-business legislation based on the opinions of one individual without much logical reasoning. Why is it necessary to ban this particular one day offer? Businesses will simply move a Black Friday promotion to another day which renders this bill mute (and are we by extension going to start banning one day sales overall? ), or extend it as others have suggested by a day or two. It's not completely policeable in the cyber spectrum, pushes up the cost for the consumer, and achieves little overall. Nay, nay, nay. We cannot just go around pointing at everything we don't like and banning it. Black Friday isn't hurting anyone, the fact you'd rather not take part in it is no more justification for this than me saying we should ban Arsenal because I'm a Spurs fan. 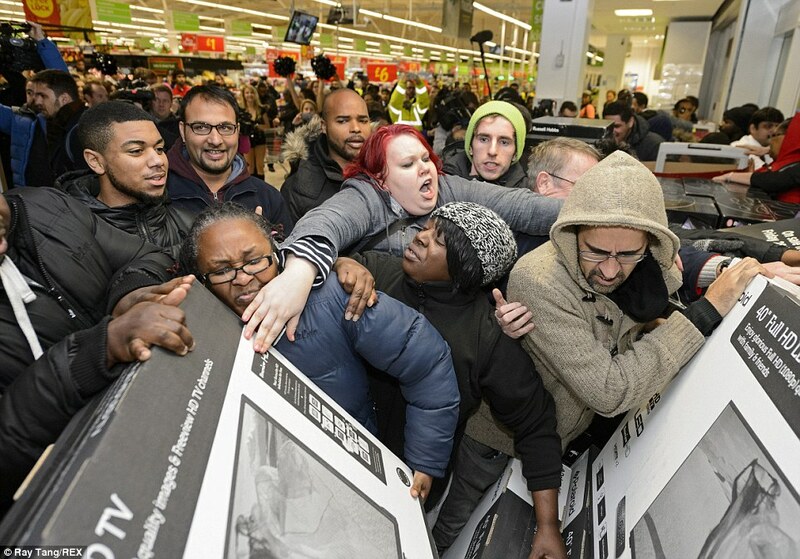 Black Friday disorder at some stores did hurt a few people. I suggested in a question to the Government making stores or anyone arrested pay for any policing required. I would also suggest restricting shop hours for larger stores so that midnight sales were prohibited. Added to that, no sick pay on the day for anyone without a doctor's note. And I responded to that question in agreement However, I don't think banning it is helpful or even desirable. All this will do is cause the retailers to start the sale the day before. I'm going to say Nay to this. I get where you're coming from, I personally think that having Black Friday is stupid and people are idiots as the sales generally last up until Christmas then new sales come in January but hey-ho, idiots do as idiots must. I don't understand why you call it an American tradition, it's a marketing ploy which has been used for yonks and in the UK they just changed it to align with the US. Cyber Monday for example has been in the UK for hell of a long time, is that a US tradition? Debatable.